In stock. Order in the next 18 hours, 10 minutes and it will go out today! George Joseph is an authority on gaming protection and cheating. He has served as director of surveillance for Bally, Paris, Aladdin and Dunes casinos in Las Vegas. He is currently the president of Worldwide Casino Consulting, Inc. which oversees the training of casino and gambling security around the world. Joseph has also trained several law enforcement agencies and has served as an expert witness and consulting investigator on countless casino cheating prosecutions. His television appearances include: Dateline NBC, 48 Hours, America's Most Wanted, Cheating Las Vegas, Cheaters Beware, Primetime, History Of Las Vegas and many others. 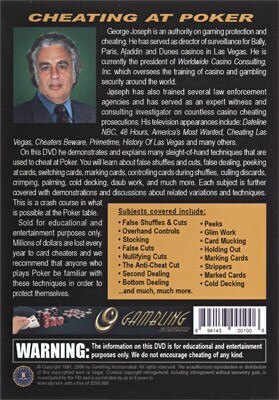 On this DVD he demonstrates and explains many sleight-of-hand techniques that are used to cheat at Poker. You will learn about false shuffles, false dealing, peeking at cards, switching cards, marking cards, controlling cards during shuffles, bend work, culling discards, crimping, palming, cold decking, false cuts, daub work, nullifying cuts, holding out, and much more. Each subject is further covered with demonstrations and discussions about related variations and techniques. This is a crash course in what is possible at the Poker table. Sold for educational and entertainment purposes only. 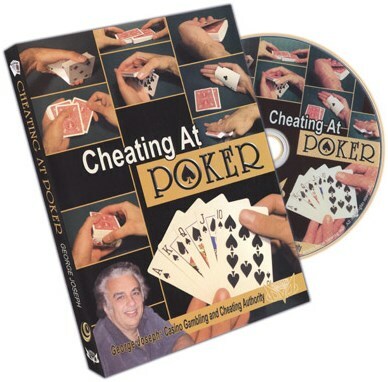 Millions of dollars are lost every year to card cheaters and we recommend that anyone who plays Poker be familiar with these techniques in order to protect themselves.